Beautiful floral lace trims delicate silk and cashmere wrap 40W x 80L Silk/cashmere Dry clean Imported. Soft Accessorie - Scarves. Bindya. Color: Black. Beautiful floral lace trims delicate silk and cashmere wrap 40W x 80L Silk/cashmere Dry clean Imported. Soft Accessorie - Scarves. Bindya. Color: Ivory Black. Elegant cashmere stole finished with chic metallic striping. Striped trim Cashmere Dry clean Imported SIZE 28"W x 80"H. Soft Accessorie - Scarves. Bindya. Color: Black. 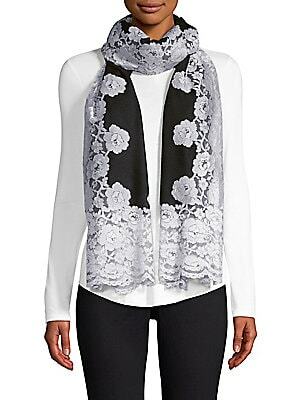 Floral lace adorns this luxe cashmere and silk scarf. 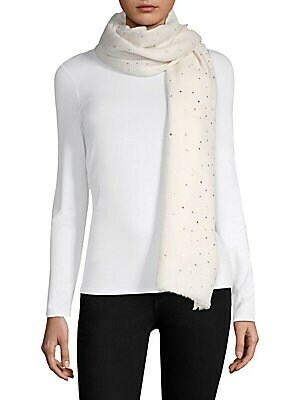 Cashmere/silk Dry clean Imported SIZE 28"W x 80"H. Soft Accessorie - Scarves. Bindya. Color: Black Multi. 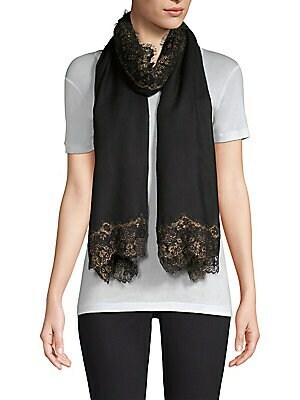 Luxe cashmere and silk shawl trimmed with delicate lace. 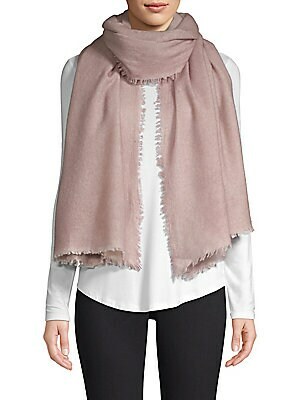 Cashmere/silk Dry clean Imported SIZE 28"W x 80"H. Soft Accessorie - Scarves. Bindya. Color: Black. 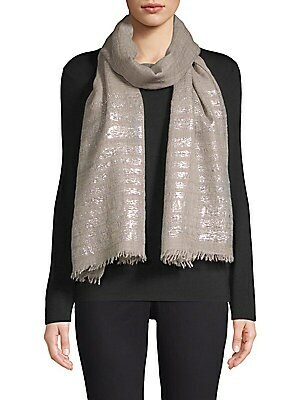 Luxe cashmere stole finished with metallic lurex stripes. Cashmere Dry clean Imported SIZE 20"W x 80"H. Soft Accessorie - Scarves. Bindya. Color: Light Grey Melange. Scattered crystals embellish lightweight silk blend wrap 40W x 80L Wool/silk Dry clean Imported. Soft Accessorie - Scarves. Bindya. Color: Ivory. 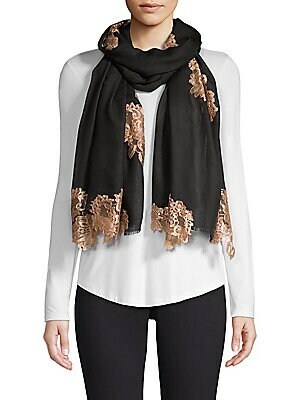 This luxe wool scarf is adorned with silk patches of evening lace. 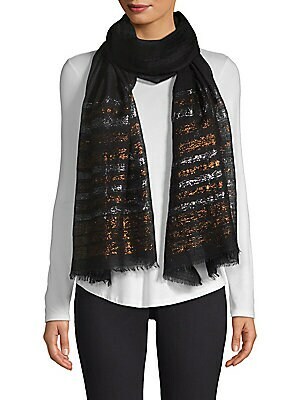 Wool/silk Dry clean Imported SIZE 28"W x 80"H. Soft Accessorie - Scarves. Bindya. Color: Black. This warm oversize scarf is crafted in luxe cashmere. 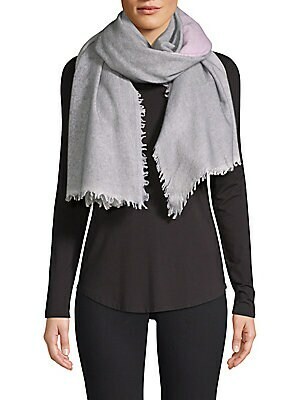 Cashmere Dry clean Imported SIZE 40"W x 80"H. Soft Accessorie - Scarves. Bindya. Color: Grey. This warm oversize scarf is crafted in luxe cashmere. Cashmere Dry clean Imported SIZE 40"W x 80"H. Soft Accessorie - Scarves. Bindya. Color: Tan Melange.